In anticipation of Destiny’s upcoming launch on September 9, fans can get a sneak peek of the game’s vast in-game worlds with Destiny Planet View. Destiny Planet View lets fans explore the future of our nearby planets and moons using this planet’s most-powerful exploration tools. Created using Google Technologies, Destiny Planet View gives fans an immersive first look of Destiny’s in-game locations on Mars, Venus and the Moon. While the experience only reveals a small slice of Destiny’s massive worlds, users will be able step through each area and discover useful lore, gameplay tips and even a few hidden real-world and in-game incentives along the way. 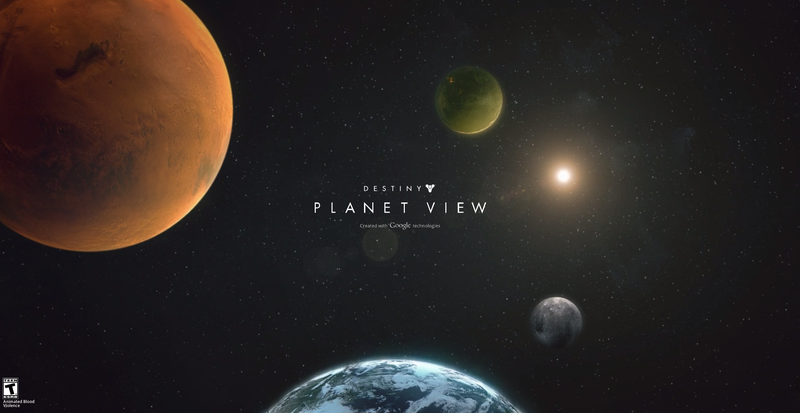 Destiny Planet View marks the first time a video game world has been mapped using Google technologies and will allow everyone to prepare themselves to become legend on 09/09/14.